Big Train brings a vibrant blend of black tea, honey, and spices that Chai is known for, as well as a whole line of classic and innovative flavors. Now you can have your favorite drink, your favorite way, whenever you want it! Hot, iced or latte � Big Train's powdered Chai mixes are easy to make. Do your tastebuds call for classic flavors like Vanilla or Spiced Chai, or something rich and indulgent like Caramel or Chocolate Chai tea, or maybe something fun and different like Raspberry or Green Tea? There are even No Sugar Added and Decaf versions of their biggest hits! Just add water, milk, or milk substitute. Mix 1 scoop (3 Tbsps or 34g) of Big Train chai tea latte mix into 6oz (180mL) of hot water/milk/dairy substitute. Stir until dissolved and enjoy. Steam 4 fl. oz. (120 mL) of milk with 8 fl. oz. (240mL) of water to 160� F (71� C). Add 2 scoops (6 Tbsps or 68g) of Big Train Powdered Chai Tea Mix, stir and pour into 16oz mug. Mix 2 scoops (6 Tbsps or 68g) of Big Train Chai Tea Latte Mix into 5 fl. oz. (150mL) of hot water, pour over 12oz (180g) cup of ice, then add 2oz (60mL) of cold milk or dairy substitute, and serve. Pour 6 fl. oz. (180mL) of water/milk/dairy substitute into blender, add 2 scoops (6 Tbsps or 68g) of Big Train Chai Tea Powder Mix, then add 12oz (180g) cup of ice into blender. Blend until smooth. With the unique bouquet of savory sweet an extra indulgence of Vanilla can bring, the classic blend of honey, black tea and exotic spices takes on a richness that must be tasted. A flavor exotic to some and yet the most classic to others, this tasty drink has been savored for centuries in India. The creamy blend of black tea, honey, vanilla, and exotic spices delights the senses and refreshes the soul. Among the savory swirl of exotic spices, black tea, and a touch of honey, bursts the rich sweetness of Dutch Chocolate; a flavor that catapults this centuries old classic into a modern day treat! A refreshing, bright burst of berry blends creamily with honey, black tea, and exotic spices creating a drink that is both charmingly ancient and inspiringly fresh. 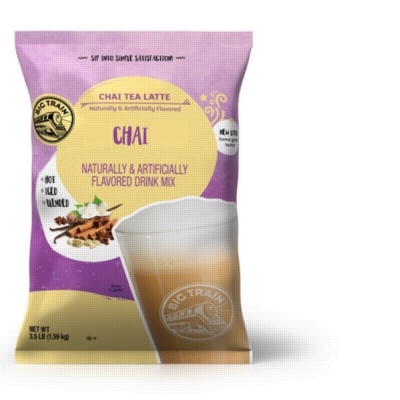 Instant chai tea mix flavors are Kosher Certified, Gluten Free, Contains no Hydrogenated Oil, and can be made with water or dairy according to preference or dietary need. Enjoy hot, over ice, or blended! INGREDIENTS: sugar, nonfat milk, coconut oil, corn syrup solids, brown sugar, black tea, natural & artificial flavors, honey (sucrose, honey), cinnamon, sodium caseinate, silicon dioxide (anticaking agent), sodium citrate, mono- and diglycerides, salt, sodium aluminosilicate, guar gum, carrageenan gum.